I wonder if this dreadful shock will awaken the Faith of the Church’s eldest daughter. A recording I made with Voice Memo of the bells of Notre-Dame. Here are the bells of the North Tower and the amazing Bourdon, the big bell “Emmanuel” (slightly smaller than the great “Savorarde” of Sacre-Coeur de Montmartre. The sound is amazing. Be careful if you have earpieces or headphones. And few months ago, I said Mass in the Chapel of the Crown of Thorns, where that great relic was kept, for the repose of the soul of the great Extraordinary Ordinary, Bp. Robert Morlino. The Crown of Thorns was saved! The Archbp of Paris, Michel Aupetit, has asked that all the bells of the city toll to invite people to pray. Firefighters are battling to save the towers. Catholics sing near their burning cathedral. This entry was posted in The Coming Storm and tagged Notre-Dame de Paris. Bookmark the permalink. 41 Responses to Fire – roof of Notre Dame of Paris – Will this shock awaken the Faith? Somehow, this seems a fitting metaphor or allegory. Immaculate Heart of Mary, pray for us and bring about your triumph! My six year old is weeping, and he’s never even been there. I know how he feels. Apparently the spire just collapsed. God knows what a wreck that just made, even if the fire is put out before the walls fall in. What about the crown of thorns? Other relics? St. Florian, ora pro nobis. Just tragic and heartbreaking. Given the vandalism of Catholic parishes across France, my first thought is arson. Supposedly the cause is due to renovations at the Cathedral. It is hard not to see this as emblematic of the destruction of the Faith in France and in Europe. That this is Holy Week just adds to the sadness. Like Father Zuhlsdorf, my mind is asking if this will rouse the long dormant Catholic faith in France, or does anyone there care anymore. One small blessing may be that the building, itself, is owned by the French Government. It should do a decent job of restoration. One shudders to think what the French hierarchy could come up with in the guise of repairing it or replacing Notre Dame. I’m in tears, personally. Not only as a Catholic, but as an art historian. Probably nobody here has read Henry Adams, but if you were in art history (as I was) until about the mid-60s, you read Henry Adams, who was a Protestant and of very Yankee roots, but really fell in love with the Virgin. I honestly could never have imagined that I’d see the day when something like this happened. It’s kind of a tiny (and surely less physically lethal) 9/11, regardless of the source of the fire. What awful news. Echoing others, I fear that some will see the restoration work as a convenient means to achieve the ‘wreckovation’ mentioned on this blog so many times before. One would hope that even in these worrying times a restoration faithful to the character of the building would be chosen. Does anybody know if the relics, especially the crown of thorns, were saved? 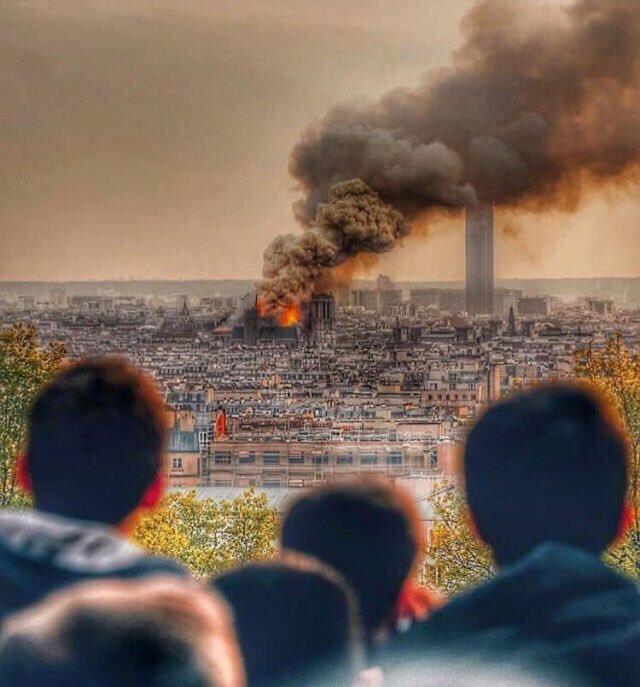 What heart breaking pictures to see Notre Dame burning. What a feeling of helplessness to see it on the news. Let us pray that the damage is not too severe. I have heard speculation that the fire is an accident resulting from ongoing building/renovation works – as can happen. However let us not forget that France is presently suffering a wave of anti-Catholic attacks on Churches, with the most high profile confirmed incident being an arson attack at Saint Suplice in Paris, recently. I hope this fire at Notre Dame is not another of these wicked attacks. Thank you for sharing the bells. I will cherish this forever. I watch it with resignation, as Clinton R said here, it is hard not to see this as emblematic of the lack of faith in France in general. France has rejected God, rejected Christianity, and embraced secularism and Islam. As one blogger said, God is just getting started. Notre Dame was a jewel, but without the faith, what are these buildings. For the record, in case anyone has been reading this commentator’s posts, last year multiple persons claimed that the use of the holy water at the Notre Dame Cathedral resulted in their being poisoned. Research the story for yourself. This commentator experienced different symptoms than those mentioned in that story, but I still firmly believe I was drugged/poisoned in a similar manner. And, this commentator’s likely being poisoned/drugged in a Catholic Chapel occurred 4 months prior to the one that apparently happened at Notre Dame Cathedral. Hopefully there is an honest and thorough investigation of the cause of the fire. Hopefully God’s House can be restored there. Great to hear that the relics were saved. Has anyone seen anything regarding the tabernacle, or if the eucharist was removed? There are videos of the spire falling. My heart hurts to even think of it. I wonder about the rose window? I always wanted to see Notre Dame….like I said, my heart is sore. Our Lady pray for us, St. Joan of Arc pray for us. Why would this event awaken anyone of weak or no faith, as applies to the vast majority in France? Although the loss is devastating objectively, historically, ecclesially and in the minds of a small percentage of people, most people are only interested today because it’s the story of the day. Next week it will have been forgotten because it will be on to the next instagrammable or tweetable or livestreamed topic, and to paraphrase Representative Ilhan Omar, this will be shrugged off eventually as “something happened to something.” The Church and Western civilization are collapsing, literally and figuratively, and many people couldn’t be bothered to care except to post something fleetingly interesting on facebook when it happens, then on to the next distraction. Agreed. Especially after seeing the remodel to the cathedral in Chartres. “When you see Paris burning you will come to know that God’s justice for the church and the world has arrived”~Jesus to Marie Julie Jahenny (The Stigmatist Mystic from Breton. But Jesus turning to them, said: Daughters of Jerusalem, weep not over me; but weep for yourselves, and for your children. We weep over the Church [a.k.a. Jesus Christ] going to Its death, rather than attending to our own conversion? We are being chastised for the sacrileges that evolved from Vatican II. No one can look back upon the last 50 years and not think that we can escape from some form of retribution. A Pope and Bishops that ignore the magisterium, practicing homosexuals for clergyman, heretical nuns. Our prelates have made us vulnerable to the wrath of a just God. I know that I am talking like some seer, but it is only my opinion. Deo gratias! A French Dominican who is living with us this term has been in contact with his family in Paris, and they just told him that the French press is reporting that the vaults did not fail and that the structure as been saved. The small fire in one of the square tower is also out. None of the stained glass was damaged. What has been destroyed is the timber roof above the vaults (medieval) and the “fleche” (19th century). I was waiting to get news on the vaults. One of their purposes was to protect the building if the wooden roof caught fire—which they regularly did in the middle ages due to lightning etc. The damage is tragic, but prayes of thanks are due for what has been saved. P.S. If this was in fact arson, would that fact be released? The latest is that, while the roof has been destroyed, the basic structure of the cathedral has been saved. I wept to see it burning earlier, but that did not compare with the depth of feeling, and weeping, I had at seeing and listening to the Faithful singing to Mary together as the Cathedral burned. I believe she heard their prayers and interceded for them to save the structure. So very, very sad. When I saw that they had tolled the bells in Orleans for Notre Dame, I felt an indescribable sense of loss. Absolutely heartbreaking, but does it not mirror what has been transpiring to the Church over the last sixty years — the flames only grow more ferocious. For those who don’t know, cathedrals traditionally were regarded as female (notwithstanding the saint for whom they may have been named) and there was a sort of mystical solidarity among them. So disasters to or the capture and fall or destruction of a cathedral would often receive a response from sister cathedrals. And thus, we must remember that the rebuilding and the rededication of Notre Dame will also be greeted by the bells of her sisters. Interior photos coming in: https://twitter.com/Valdiguie/status/1117912792298745856 It looks like the Pieta at the altar is still there. A thoughtful firefighting thread is at Gregg Favre’s Twitter account. Anybody who has been on the Chartres Pilgrimage will recognise the tune. In fact, it wouldn’t surprise me if some of these folk had been on it. Bcpsummers — “les saints sacrements” that were saved are apparently the French term for the consecrated Hosts. Amusingly, the holy relics and treasures were taken to the Paris city hall, where they looked out of place but seemed respectfully treated. The Daily Telegraph has a picture. Juxtapositioning this, but if the burning of the Notre Dame Cathedral sparks a flame of renewal in the Catholic Church in France, is not one building worth it? At the risk of sounding like a real SOB, when I saw Notre Dame on fire, I thought, “Well, at least it was destroyed by fire and not Richard Vosko,” even if it was arson, the damage is less than what was perpetrated by priests and bishops during the Revolution. Noteworthy: Not governments but so called “capitalist pigs” have pledged thus far over 500 million Euros – and growing – to rebuild Notre Dame. A friend shared a thought with me from a Carmelite sister, “Our Lady has left Paris”. Yet, I am greatly moved and encouraged by the Parisian voices lifted to Our Lady in their beautiful song of the rosary. Clearly, they still love their Mother, and perhaps in losing her, they will come back to her with all their heart. Remember 911 and how that tragedy moved and changed so many hearts. acardnal: Good point. There’s a resemblance here to the early Renaissance and Florence, and St. John Paul II in Centesimus Annus #42.